January 5, 2015, Toronto, ON – BonaVista Pools www.bonavistapools.com wins top honor at the 2014 Design and Construction Awards hosted by the Pool and Hot Tub Council of Canada in these three categories: residential outdoor self-contained spa or portable hot tub – gold, concrete hot tub and pool combination – bronze and swim spa/current pool – bronze. The gold medal project started with a client Paul Boniferro who wanted to make better use of his rooftop space to enjoy a quiet tree top retreat to entertain and relax with friends. Inspired by the natural North Toronto surroundings near Sunnybrook, he wanted a luxurious outdoor space that he could enjoy all four seasons and that was an extension of his indoor living areas. “The transformation was remarkable. I was able to fit all my ‘must have’ items; hot tub, barbeque, outdoor bar, TV, shower and outdoor lounge, into a small, 800 square foot roof top space. My roof top is now a luxurious retreat which I can enjoy all year round”, says the homeowner. BonaVista Pools received the coveted gold title based on the following criteria: design, building process, complexity, creativity, quality, lot size, and landscaping. The judging focused on pools and hot tub projects built in the past four years. The aesthetic features of the installation included decking, landscaping and/or other amenities that are clearly part of the environment. Submissions were only accepted if the project had not won a gold, silver or bronze award in the past four years. “This project was a collaborative effort. BonaVista is fortunate to work with some of the finest landscape designers and architects in Toronto, allowing us to help bring our clients’ vision to life. We worked together as a team to deliver the home owner their dream outdoor space,” said Jennifer Gannon from BonaVista Pools. The roof top oasis blends beautifully into the Sunnybrook landscape. 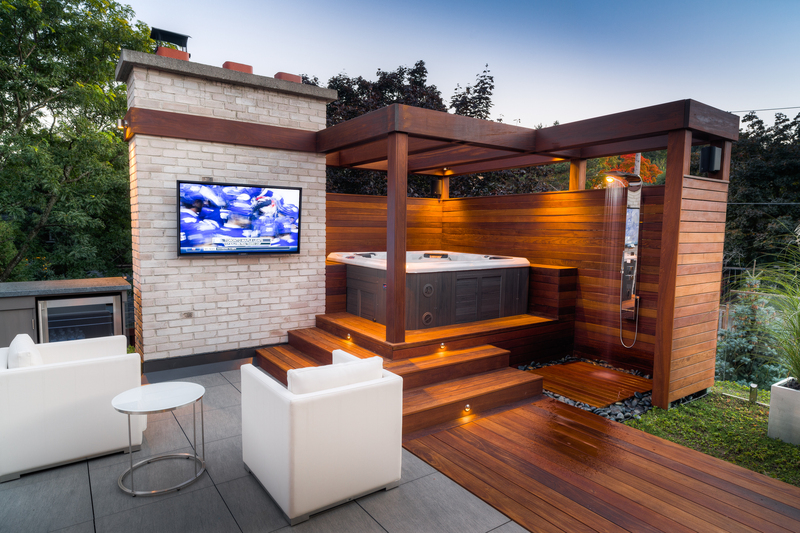 The use of natural ipe wood from Brazil and placement of hot tub, shower and lounging areas tucked nicely into the corner of the rooftop maximizes privacy for the owner. Boniferro wanted a private space where he could relax in the evenings or gather with family and friends to entertain and enjoy the outdoors. About BonaVista BonaVista Pools is a family owned and operated business with over 45 years of experience in custom concrete water projects; from sporty indoor pools, chique backyard spas and “Zen-like” water features, to tranquil lakeside landscapes. BonaVista is the waterside expert for the backyard escape. BonaVista, Italian for beautiful view, which was the late Bob Brown’s dream and the mission statement for the company he created for his family: Melissa Brown, Jennifer Gannon and Peter Brown. Bob’s goals for BonaVista revolved around the client’s dreams. Melissa, Jennifer and Peter will continue to follow in his footsteps. About BonaVista LeisureScapes BonaVista LeisureScape is a 4,400 square-foot outdoor living boutique and showroom in Leaside offering customers the perfect compliment to the products and services delivered by their parent company BonaVista Pools – it’s the one-stop-shop to accessorize your outdoor space. For the BonaVista Pools customer who wants more than just custom pools and spas “LeisureScapes” is born! The BonaVista LeisureScape “dream team” is ready to answer all questions about creating urban retreats outdoors. BonaVista LeisureScapes hand-picks local and international products and designs to provide a personalized service for each client’s specific “LeisureScaping” needs. – 30 – For more information or to arrange an interview, contact Tory Crowder, Jump Start Communications www.jumpstartcommunications.com torycrowder@sympatico.ca.